As you are undoubtedly aware, the NFL lockout stands ready to ruin not only our fall television watching but football card collecting too. Nevertheless, I believe I have developed a solution that the NFL, NFL Players Association and Topps should consider – 2011 Bowman Lockout. Although I'm intending this as a parody to smile at during a time when there isn't much smiling, I've taken the liberty of drafting a press release for the set in case the decision makers and card-collecting power brokers want to actually run with it. Today, Topps partnered with the NFL Players' Association and NFL to announce a new football product for 2011 Bowman Lockout. The release is truly historic. With the players locked out and the NFL season in jeopardy, the real off-season action took place in boardrooms and the courtroom. Bowman Lockout focuses on these historic off-field skirmishes. “Until now trading cards have been monopolized by the players," a spokesperson for the NFL stated. “It's their turn to give up the spotlight and let it shine on the other heroes. So, for Bowman Lockout, players' cards are inserts. The base set, is everyone else." The set consists of the true 2011 gladiators: the lawyers, judges, owners, business executives and players' association officers. Bowman Lockout has over 150 different lawyer cards alone. And with this shifting focus, new statistics were created including “Billable Hours," “Billable Rate," and “Heart Attacks," because you are not a seasoned litigator until you've had at least one coronary. “We're really proud of the dual autos," commented a spokesperson for Bowman. “No one to date has collected relic autos from legal documents or office furniture. 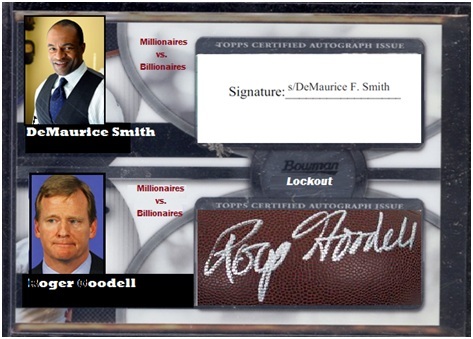 My favorite card this year is the Millionaires vs. Billionaires one-of-one dual autograph/relic patch featuring DeMaurice Smith and Roger Goodell. The Goodell patch is actually leather from his office chair, while DeMaurice Smith's signature is from an actual court filing! And we think we're making history because it's an electronic signature! Truly priceless." Other cards of note include litigation-used patches made from the actual suits and ties worn in court, triple autos of the Eighth Circuit Appellate Court's three-judge panel, collegiate law school patches from Harvard Law, the London School of Economics and Wharton School of Business, and relic cards of the last collective bargaining agreement which was cut apart to make 2,000 unique and irreplaceable cards. Another NFL spokesperson was also very excited about the product. “There've been thousands of court filings and cease and desist letters issued already this year…each one signed by an actual lawyer…and we gave them all to Bowman to turn into relic cards. Besides, collectors were getting sick of seeing their favorite players hidden behind helmets, or always in their team's uniform. Now, collectors get the opportunity to see their players in different uniforms…like Starbucks or McDonald's. Fans will also get to enjoy art of their favorite players out clubbing, golfing, hunting or injuring themselves playing a pick-up game of basketball." The spokesperson for the NFL Players' Association was not as happy with the Lockout product. “Sure, both the NFLPA and NFL receive cuts--but the NFL isn't telling us how much they're making, so we don't know if what we're receiving is good." Bowman Lockout is slated for a July release. It is expected to cost about $800 per hobby box, given that both the players and owners need to make money from the fans somehow. As one fan lamented, “Regardless of what happens with the lockout, the price of admission or of beer and hot dogs at the stadium won't go down. I guess since buying a box of these cards costs a little less than season tickets, it's a good buy for me because it'll likely be the only football I get to see this year." Bowman also indicated that plans were in the works for potential Lockout baseball and basketball products too. 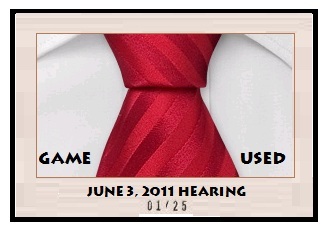 “With both of the NBA and MLB's CBAs expiring this year, and the NHL's expiring in 2012, this may be a recurring product!" (5)2011 Panini Rookie+Stars NFL Football Factory Sealed Box-Look for AUTOGRAPH! I can’t wait to see the dual relic autos of the judges in the super premium 2011 Bowman Sterling Lockout, featuring judges rookies with swatches of gavel, black robe, and an auto! Look for gold refractor parallels with premium laundry tag swatches too!